She was expected to win, she thought she had lost and she ended up drawing. 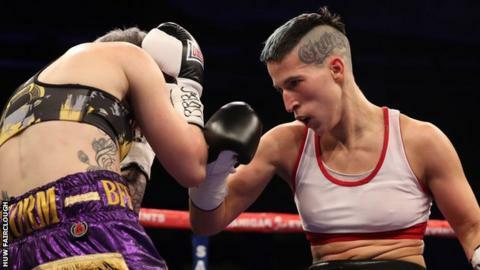 That was the remarkable evening for Wales' Ashley Brace in her European bantamweight title fight against Spain's Melania Sorroche in Merthyr. The judges scored the contest 96-94 for Sorroche and 97-93 for Brace and 95-95, resulting in a draw, which will be the official decision. However, in a huge blunder, the score was initially announced as a split decision victory for Sorroche. The mix-up came as a result of one of the judges' scorecards being added up incorrectly. Judge Leszek Jankoviak's card was announced as a 96-95 win for Sorroche but had been calculated wongly, with his actual verdict being 95-95. Unfortunately, the mistake was not spotted until about 20 minutes after the contest finished. The unfortunate mix-up tarnished what was a tremendously exciting fight, where Sorroche set a ferocious pace and had no intention of boxing defensively, making for an entertaining match-up where she often seemed the aggressor, despite Brace landing the cleaner shots. The 26-year old Welsh fighter, who trains with world champion Lee Selby, had been undefeated in seven fights since turning professional. Headlining the show in Merthyr, WBC international champion Brace had hoped to advance to 8-0 as she bid to set up a world title opportunity in 2018. "I didn't expect that. I am devastated," said Brace after the draw was confirmed. "Obviously the plan now is a rematch, it is bizarre. "I thought I lost, but it's a draw, I don't know. "I don't know how someone coming forward throwing shots willy-nilly wins rounds. "I don't feel any better with it being a draw, I still lost because I didn't take the belt. "It is obviously better, but I am still devastated, that's the way it goes. "I have a lot to learn and in every fight I am learning something different." Brace's trainer Tony Borg was disappointed with the judges' verdict. "I thought she won comfortably by two or three rounds," he said. On the undercard, former IBF world bantamweight champion Lee Haskins returned to the ring with a points victory over Isaac Quaye. Nathan Thorley scored a second round victory over Jermaine Asare to win the Welsh light heavyweight title in a battle which featured two Commonwealth Games bronze medallists. Jacob Robinson, the son of former Welsh world champion Steve Robinson, enjoyed a KO victory over journeyman Dmitrijs Gutmans on his professional debut. Gavin Gwynne won the Welsh lightweight title and moved to 8-0 against Henry Janes.